Yeah yeah, good things happened, too. Blow me. We ran out of nasty adjectives for 2016 in September and have been making them up in sheer improvisational rage ever since. I make a practice out of not wishing my life away, and even I’M glad to see that calendar roll over, at long last. Anyway. 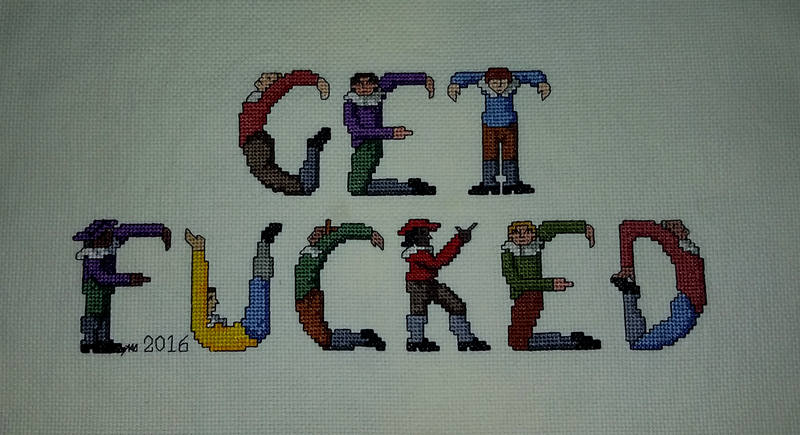 GET FUCKED is stitched on ivory 14 count aida cloth using two strands of DMC stranded cotton flosses for the x’s, and one strand for backstitches.I modified the charts with some further subversion by actually giving them skin tones that weren’t paper white. And then, of course, some of the hands underwent surgery to reflect with greater accuracy my complete distaste for the year just past. Unfortunately, I’ve got a tall stack of things that have to be framed before this can be. I’ll post another pic when that happens, hopefully sometime in a much happier 2017 for all of us.